[map] [street view] Located west of Butler on AL-10 (Pushmataha Street), near the intersection with Sheffield Street. [Image] Picture of the RDS data display from an unknown vehicle. ** - if this is your photo, please e-mail me (webmaster (at) almediapage (dot) info) and let me know so I can properly credit you for it! The original permit for this station was granted in 1997, as WPRN, FM companion to an AM station with the same calls. 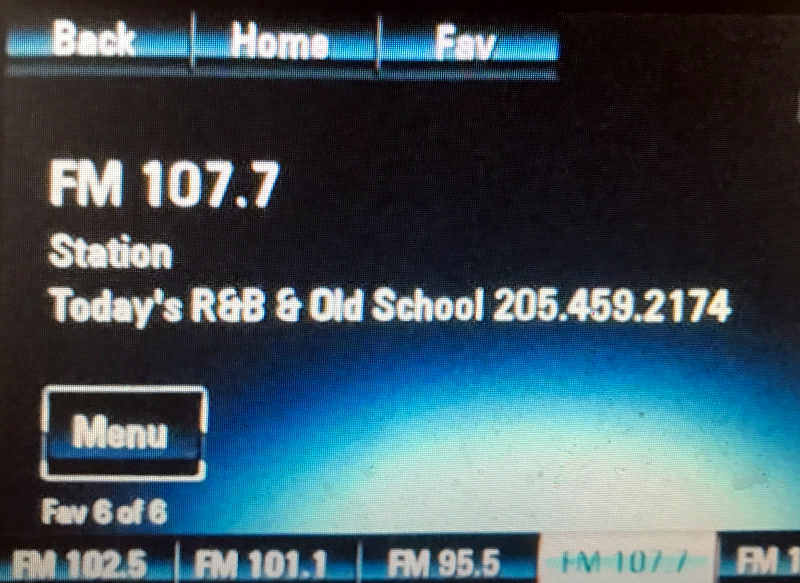 The station signed on in 2003 and only a few months later Butler Broadcast turned in the license for the AM station. The station carried both country music and some gospel/religious programming. The license was transferred to Joy Communications in July of 2011, converted to non-commercial operation and around this time the station was either already silent or fell silent thereafter. It remained mostly off the air since then. Joy Communications announced the sale of the station to Leap of Faith for $10 in the late summer of 2012. Leap of Faith is owned by Joshua Coyle, who appears to be a local Seventh Day Adventist minister in Butler. Shortly before the sale was announced, the calls changed to WHSL, to coincide with a country format as "Whistle 107.7". The station stayed off the air for a long time while the station's audio feed redirected to an LPFM jazz station in Florida. In October 2012 the station converted back to commercial operation. But no one could confirm if the station ever went back on air at this time. In early November 2014 the license was transferred from Leap of Faith to WHSL, Inc. The station appears to be back on the air as of the start of 2015. At some point the station morphed from Whistle Country to "Superstar 107.7", still with country. At some point in the spring of 2017, the station dropped the country music format for urban contemporary as "Hot 107.7". That lasted until October 2018, when the station filed to go silent due to the poor economy in the area they serve. The station was donated to The Augustus Foundation (led by Michael Augustus) for a $42,000 tax deduction. The call sign is pending a change to WBJZ after the license transfer closes. The station will resume operations as a non-commercial operation.